The defending champs take another win into 2017. The Waterford football team — which was a perfect 8-0 in the Tri-Valley Conference Hocking Division last fall — was predicted to repeat as champions of the nine-team league, in a preseason media poll conducted by the Ohio Valley Publishing sports department. Waterford garnered half of the six first place votes, to go with three second place votes for a point total of 51. Also picking up three first place votes, Trimble finished second in the poll with 48 points. The Tomcats were 7-1, finishing second to Waterford in the 2016 league race. Third in the poll with 39 points was Southern, which went 6-2 in the league last year en route to third place finish and the program’s second-ever postseason appearance. Miller — which went 5-3 in the league in 2016, taking fourth place in the standings — was picked to finish fourth yet again, receiving 34 poll points. Eastern took fifth in the poll with 29 points, after a 3-5 mark and a sixth place finish in the 2016 league standings. One point behind the Eagles, taking sixth in the poll, was Belpre, which was fifth in the TVC Hocking last year, going 4-4. Wahama — which went 1-7 in the league in 2016, finishing eighth — placed seventh in the poll with 22 points. South Gallia was picked to finish eighth in the league with 13 points. The Rebels were 2-6 in the TVC Hocking last fall, finishing seventh. Federal Hocking went winless in 2016 and was unanimously picked to finish at the bottom of the league again in 2017, garnering just six points. 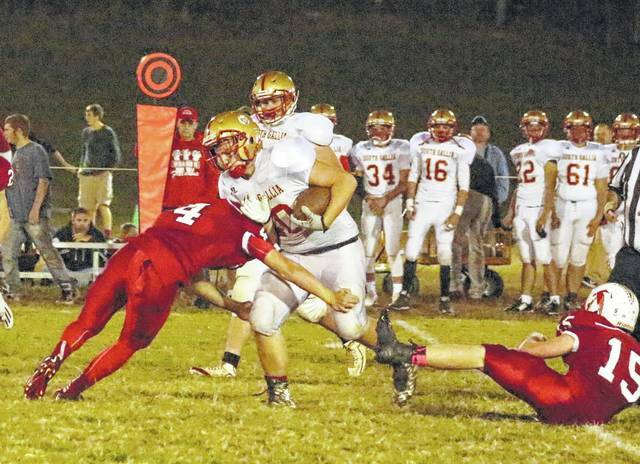 South Gallia sophomore Jeffery Sheets (40) runs through a Wahama defender during a Week 8 TVC Hocking football contest at Bachtel Stadium on Oct. 14, 2016, in Mason, W.Va.